Photo by Mister T from the Londonist Flickr pool. 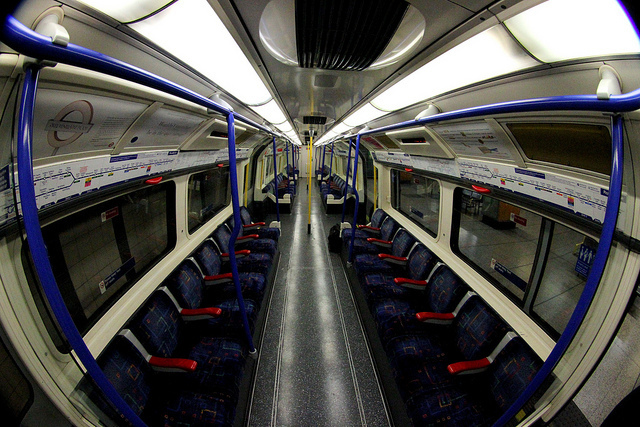 One of our favourite things on the tube is when you let a busy train go by and the next one rolls in a minute later — much emptier — so you can grab a seat on it. “I’m so glad I waited” you might think to yourself. But did you know there are places on the network where you don’t have to leave this to chance? And if you know what you’re doing, you can plan to get a nice empty carriage and seat to yourself. During the day on the tube, there are several places where the trains don’t run from one end of the line to the other but instead terminate earlier into a siding then reverse and come back out again. London Underground do this so that the frequency of trains in the central area is kept higher than the extremities, but the bonus for you if you live near one of these places is that if know when a tube is due to come in out of the sidings you can get yourself a nice empty carriage to sit in. Willesden Green to North Greenwich. A classic… as you can even see the train in the reversing siding just to the north of the station, and if its white lights are on then you know it’s getting ready to come out of the siding and into service. So if you’re at Willesden (or perhaps Kilburn or West Hampstead) heading south into town, you should know that trains are scheduled to leave Willesden at the following times during the day: 13, 28, 43, 58 minutes past the hour. (Note: some Jubilee trains also reverse and come out of a siding at Wembley Park heading back into town so it can be done here too). This author's local station is Acton Town and many a time I have let a packed train heaving with people fresh off of a plane from Heathrow with suitcases clogging up the train head off into the central area and then caught the next one – which has come out of Northfields depot/siding having started at Northfields at 09, 29 and 49 minutes past the hour. There are many Central Line trains that run back and forth between White City and Newbury Park rather than going all the way to West Ruislip or Epping. So if you’re heading east into town from White City or Shepherd’s Bush let the busy train go by and instead wait for the much emptier one: White City at 14, 34 and 54 minutes past the hour. (Note: some Central line trains also reverse and head into town from a siding at Northolt). If you live out east coming into the centre of town, don’t cram yourself onto a District train – consider getting a Hammersmith & City one that starts nice and empty at Barking. Also, don’t forget that some District line trains terminate and head back west into town at Tower Hill. As you come down the steps to the platform, the majority of trains leave from the platform on your left, people tend to miss the one lit-up sign that tells you if the train on the right is leaving anytime soon. Well actually there are three an hour and they leave at 05, 25 and 45 minutes past the hour, taking away that indecision and letting you avoid a potential crush. The morning peak into town can be a crush, but if you’re starting your journey at Seven Sisters, you can let the busy train that’s started at Walthamstow go, and get these ones instead: 05, 15, 25, 35, 45, 55 minutes past the hour. Heading south on the Bakerloo line it’s also worth knowing that there are (generally) four trains every ten minutes. One of which starts at Harrow & Wealdstone, one that starts at Stonebridge Park, and two starting at Queen’s Park heading south in central London. So if you’re at Stonebridge Park or Harlesden and a packed Bakerloo line train comes in, it’s the one that’s come all the way from Harrow. If getting a seat means that much to you, wait five minutes, and the much more empty one that starts at Stonebridge Park will arrive. There’s only one good place on the Northern line that we could find where you might get an empty train, but it won’t suit morning commuters! There are six Northern line trains that come empty out of the depot at Golders Green then start at Hampstead and head south into the centre of town between 4.30pm and 6pm each day.